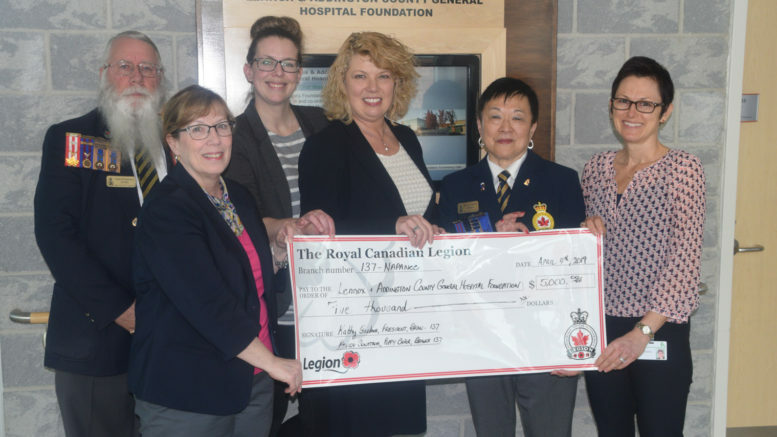 Napanee Legion Branch 137 vice-chair Chris Ingersoll (left) and president Kathy Gardiner (second from right) present a $5,000 cheque to Lennox Addington County General Hospital Foundation's Adrienne Harris-Hale, Erin Brown, Karen Pearson and Michelle Dickerson to go toward's the hospital's CT Scan. The money came from the Royal Canadian Legion Ontario Command. Photo by Adam Prudhomme.